On the north-western side of Serengeti National Park, 60 kilometers from Ndabaka Gate (Western gate to the Serengeti National Park) one will meet great people named Wazanaki ethnic group. Butiama is the birthplace and burial location of the ‘Father of the Nation’, Mwalimu Julius Kambarage Nyerere, the founding president of Tanzania who began his political career in the early 1950s, led Tanzanians to independence in 1961, and remained in politics until his voluntary retirement in 1985. - A home stays with Wazanaki family to enjoy traditional food and their unique lifestyle. A welcome to Mwalimu Nyerere homestead. Get a guided tour around the home and the Mwalimu Nyerere mausoleum then proceed to the Mwalimu J.K. Nyerere Museum and then to the village area where cassava farms are found. Get a glimpse of cassava farming. Visit a traditional healer famous for treating infertility together with other diseases since the ancient times. Option 2: Visit Nyerere homestead and then proceed to the Butiama Museum before walking to Mtuzu hill, a short memorable Kili trekking tour which is organized every September to raise money for charitable ends. Our visitors will have an opportunity to explore a hot spring found in the area while enjoying magnificent iconic kopjes dotting the land and finally get a cultural insight of Wangoreme inhabitants of the area. Listen to folklore and nice stories about their culture as it’s explained to you by Wangoreme elders. We can link you to Serengeti National Park, the home of the great wildebeest migration a most spectacular rut of wild animals. Participate in daily African life activities, volunteer in primary, secondary and/or nursery schools teaching various subjects, you can also have a wonderful volunteering experience in health projects within and around Mara region getting there: Butiama Museum Get an insight of the life history and the way of life of the Zanaki people. Appreciate beautiful landscapes with hills, mountains and learn about their kinship leadership system. - A visit to The Mwalimu J.K. Nyerere Museum hike of just over an hour. Get a panoramic view of the Butiama village the farms and people’s settlement, Lake Victoria, and the Mara River valley. Take a round guided walk around Father of the Nation’s homestead and then walk down through a village to visit traditional Wazanaki homestead, to explore the culture and then proceed to visit Kyarano dam, and the farms of Mwalimu Nyerere. - Visitors with a full day may opt to visit the German soldiers hiding caves, a place used as armoury for military weapon and German graves that exists since colonial times on Chamuriyo hill. - Tailor-made tours and excursions can be organized where mountain bikes can be used as a means of transport. The energetic Wazanaki traditional dancers will give you an insight into their culture by their captivating songs and dances. You can watch, experience and even participate in a variety of dances symbolizing various occasions and traditional events such as traditional marriage & bride-price giving ceremonies at home. 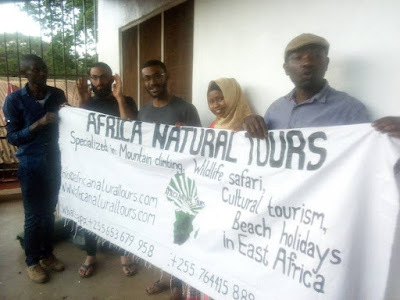 Kilimanjaro Climbing-Fund rising for Nyerere Education & Health Fund, Butiama Cultural Tourism Enterprise welcomes all interested people around the globe to participate in this & Cultural Tourism Enterprise is located in Western Serengeti about 60 kilometers from Ndabaka gate off Serengeti National Park. One can board the commuter buses, dala dala, that ply the route between Butiama and Musoma throughout the day. Butiama is located only 40 kilometers from Musoma. Alternatively, visitors arriving from Arusha can travel on one of the passenger buses that travel daily between Arusha and Musoma, and get off at Butiama. A number of options exist. JKN Hotel offers decent accommodation services with 14 rooms that can accommodate up to 20 visitors. There are special rates for students visiting us. Home stay and camping options are available. Our rates are affordable. The Butiama mosque hostel offers modest accommodation with 8 rooms capable of accommodating 12 visitors. Couples are required to show proof of marriage.